The impeccable and erudite Chairman of the Department of Asian Art at the Metropolitan Museum of Art, James C.Y. 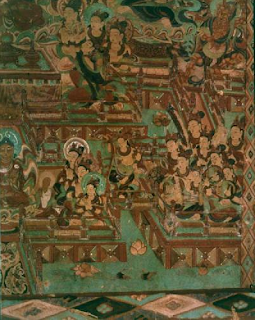 Watt, lectured on Form and Space in Chinese Painting at the New York Studio School January 9, 2011. I forgot my sketchbook so was unable to take notes but the loss facilitated full focus on the cogent images Watt presented. His focus concerned the evolution of form and pictorial space through Chinese history from early ceramic disks through Yuan Dynasty landscape, after the Mongols invaded China and opened its sphere of foreign influence. 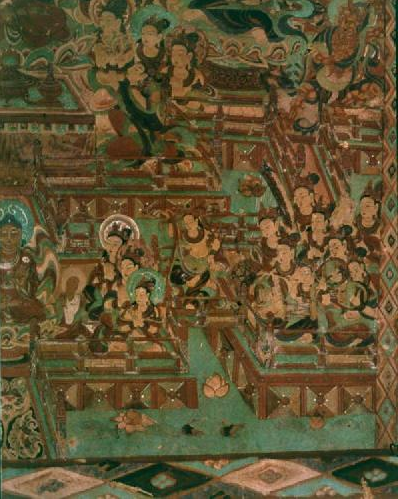 From interlocking geometric patterns such as the yin-yang symbol, space evolved on and around spherical containers and maintained its finite structure as interlocking "cells" as in the Dunhuang Cave example at top. These cells, knit together in composite space, later dissolved into strong fore- and backgrounds with indeterminate middle distance bridging front and back, top and bottom, as in Ni Tsan, middle image. 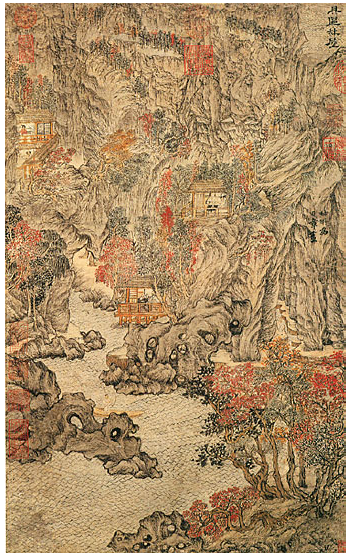 In the Yuan period, below, structure gives way to an emphasis on brushwork, resulting in imaginary "concoctions" (Watts' term) as in Wang Meng. As a devotee of Wang Meng I felt gobsmacked by this categorization of his work as I have long cherished the Chinese dictum that landscape is both observed and translated. The idea suggested a fissure between Song and Yuan Dynastyies as radical as Renaissance painting to Impressionism--a rift I'd never considered in the history of Chinese landscape, which I've idealized in Taoist terms. The spare, geometric images Watts showed us expanded my awareness of Chinese landscape in a new way, reaffirming his allusion to Panofsky's insight that "the history of perspective may be understood with equal justice as a triumph of the distancing and objectifying sense of the real, and as a triumph of the distance-denying human struggle for control; it is as much a consolidation and systematization of the external world, as an extension of the domain of self." Not until Watt's talk did I link the emphasis in traditional Chinese painting on the anthropomorphic landscape with western perspectives, even having just read Panofsky's Perspective as Symbolic Form! Click on the link above for a 1981 article by Watts about the Chinese zither (quin) in Orientations to gain a deeper sense of the instrument and how it was portrayed in various epochs of Chinese painting. His recent World of Khubilai Khan, Yale University Press, which accompanies his recent major exhibition at the Met, will be my next read. Thanks to the New York Studio School for hosting such a wonderful lecture series, open and free to the public on Tuesday and Thursday nights. For more information about the spring 2011 lecture series, visit http://www.nyss.org/lectures/spring-2011/.